Sir Frank Crisp – a brilliant, eccentric man with an irrepressible taste for the bizarre – bought Friar Park in 1896, and replaced the old house with a sprawling 120-room mansion. He was also a gardening enthusiast, and an acknowledged expert on Alpine plants, and decided to construct a 30-ft high replica of the Matterhorn in order to provide an appropriate setting for his outstanding collection He imported thousands of tons of rocks from the firm of James Backhouse and Son, whose chief foreman, Mr W A Clark, came down to advise Sir Frank’s Head Gardener, a Mr Knowles, on their arrangement. It was then decided to incorporate some water features and grottoes into the scheme, and James Pulham and Son were brought in to re-landscape the garden. That was in 1898, just after the death of James 2, so this was probably the first project for which James 3 was mainly responsible. 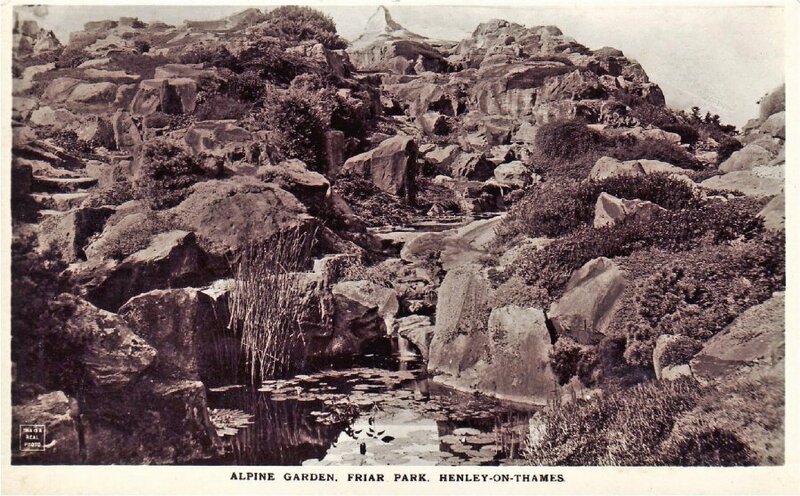 A flight of steps leads to a grotto about halfway up the ‘mountain’ from a delightful little waterfall and pool at the entrance to the garden, and a path leads down again between lichen-covered rocks, around the edge of another pool, and into the bottom of a charming valley, from which the postcard published c.1910 – reproduced here – was taken. The Pulhams visited again c1912 to enlarge the small lake beyond the lawns at the back of the house, and create a Japanese-styled garden at the bottom, beneath which they created a series of underground Pulhamite-lined tunnels and water grottoes. Sir Frank died in 1919, and the estate became derelict during its occupation by a Catholic convent and parochial school. Thankfully, it was discovered by George Harrison, ‘The Quiet Beatle’, who immediately fell in love with it, and bought it in 1971. He invested a fortune in bringing this superb example of Edwardian fantasy back to life, and it is currently being wonderfully maintained by George’s widow, Olivia Harrison. A full description of the work done by James Pulham and Son at Friar Park – together with a number of pictures – can be found in Chapter 24 of Rock Landscapes: The Pulham Legacy – the critically-acclaimed and lavishly illustrated definitive story of the lives and work of James Pulham and Son. Written by Claude Hitching, with featured photography by Jenny Lilly. Published by Garden Art Press. Posted on September 9, 2014 June 27, 2016 by Claude HitchingPosted in Book ContentsTagged . . James Pulham and Son, Claude Hitching, George Harrison, Grottoes, James Backhouse and Son, Japanese-style garden, Rock Landscapes: The Pulham Legacy, Sir Frank Crisp, Vriar Park - Henleu-on-Thames, waterfall.